The most famous Thomas Edison quote goes, “Genius is one percent inspiration and ninety-nine percent perspiration”. While the creation of the light bulb was still in process, Edison lived to this statement every day. While he made his hand blown glass bulb, he tried over 3,000 theories which were all different, he also tried around 6,000 types of filament, on how to extend the light bulb’s life for more than just a few hours. For the first time in 1880, Edison created a 16 watt light bulb, which burned for more than 1,500 hours. These people like him are very rare, which stick to something and are determined to work until it happens, even if they have thousands of failures in a row. And these are the only people that keep us going, and they are the one that create and carve the future. Jack Andraka, who us a 15 year old boy, and lives in Crownsville, Maryland, is also living by the quote from Edison. Jack watched a close family member of his, die from pancreatic cancer, this person was his uncle. Most people would accept it as it is, and say that it is just life, you can’t do anything about it. But not Jack, he chose the other side and became proactive. He found out that one of the main problems was, that the cancer was found very late. So he developed a way to find cancer when it is only in its earliest stages. Pancreatic Cancer is one of the worst cancers, and it is taking more than 34,00 lives in a year. In many cases, Pancreatic Cancer is discovered very late, so the survival chance from it is very low. Why is Andraka’s Test Different? 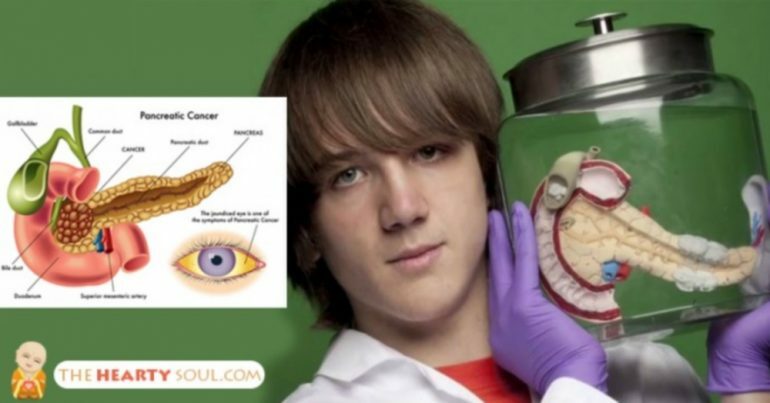 The methods we use for detecting this kind of cancer are more than 60 years old, they cost around $800, and they can’t find anything in more than 30% of the researches for cancer. Its accuracy rate is much higher, and it takes only 5 minutes of your time. Compared to the standard tests which cost a ton of money, and they are old and ineffective for finding pancreatic cancer. Jack is still in the phase of testing this method, which means it will not be available to the public world for the next 5 to 10 years. Any new treatment which is about to be developed, first must go through a row of testings. This process must be done, so that the medical and scientific communities are sure in the safety and effectiveness of the method. Then it is released in use. Disclaimer: Before you start any treatment that is not still approved, please consult with a specialist or a health care professional. Any treatment like a diet, or a health care. Also be very aware, not to stop any prescribed medications, without consultation. Also you should be aware that, none of the natural remedies, treatments or nutritional products on our site, are posted to cure, prevent, treat or diagnose any disease. The topis on our site are posted for informational and educational purposes only! Nothing on our site should be a medical advice, or should be considered as a diagnosis, or a treatment. Our users should always seek a medical professional and ask an advice from them, before doing something on their hand. Never stop a prescribed medication, or leave a medical advice, just because of something you have read here. Nothing that is contained on this site, shall be considered as a cure for a disease!